Weight: 50 (gr) . 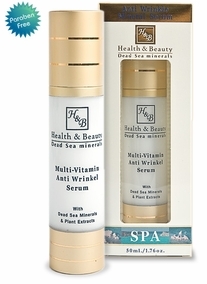 Multi - Vitamin serum for the prevention of wrinkles. Air pollution, smoking, mal - nutrition and hormonal changes are all factors that make the skin look tired, and lacks elasticity. For all these causes, one of the best and most revolutionary serum was mad. The serum covers the body with silky texture, a cocktail of pure beauty containing a complex of vitamins which nourish the skin giving it the stretched effect and solidity . Vitamin A: improves elasticity and smoothens wrinkles by maintaining a smooth and homogenous texture. Vitamin E: major anti - oxidant in our bodies, depresses aging of the skin by neutralizing free radicals and lowering damages of the sun. Vitamin C: A leading anti aging factor, providing a brightening effect and treating sun damages and spots on the skin. 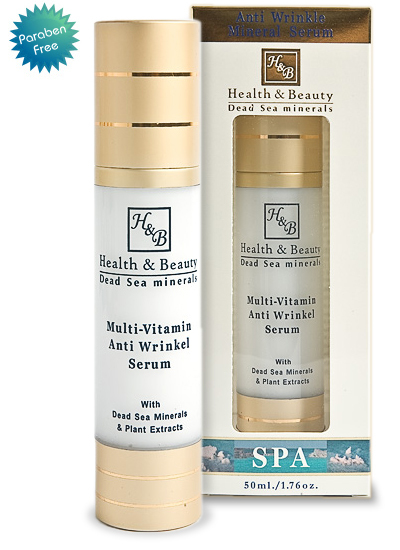 The serum is rich with extracts of carrot oil, olive oil, Evening Primrose Oil ,rose hip oil, vital fatty acids omega 3& and active minerals of the dead sea. This unique combination of the different factors gives the skin a cover of moisture, elasticity and a shiny look. Recommendation: for use by women over the age of 25. Method of use: to be applied in the morning and the evening on a bit wet and clean skin, drop several drops of the serum over the skin of the face and neck, massage the skin by a gentle central movements up and apply a moisturizing cream.